The Acromioclavicular (AC) Joint is a common site of injury particularly for athletes involved in contact and collision sports such as Australian football and rugby (league and union), and throwing sports such as shotput. The AC Joint makes up part of the shoulder structure. It is the point at which the lateral end of the clavicle (collar bone) meets with the part of the scapula (shoulder blade) called the Acromion Process. It can be identified by sight and touch as the pointy protrusion near the top, outer edge of the shoulder. The joint is surrounded by a joint capsule and is provided additional support by the acromioclavicular and coracoclavicular ligaments (the coracoclavicular ligament is made up of the trapezoid and conoid ligaments. 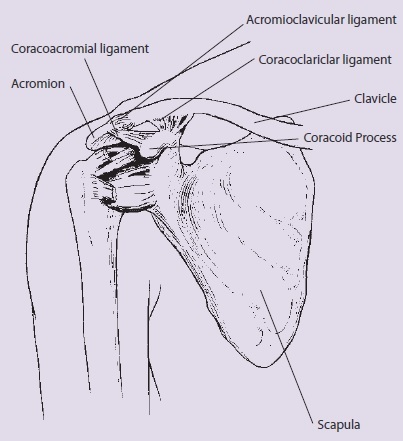 The acromioclavicular and coracoclavicular ligaments are usually damaged in the most common injuries to the AC Joint. An AC Joint injury often occurs as a result of a direct blow to the tip of the shoulder from, for example, an awkward fall, or impact with another player. This forces the Acromion Process downward, beneath the clavicle. Alternately an AC Joint injury may result from an upward force to the long axis of the humerus (upper arm bone) such as a fall which directly impacts on the wrist of a straightened arm. Most typically the shoulder is in an adducted (close to the body) and flexed (bent) position. Wearing protective strapping to support a previously injured AC Joint, particularly in contact sports or sports where full elevation of the arm is not so important. Protective padding is also used in sports such as rugby. Warming up, stretching and cooling down. Participating in fitness programs to develop strength, balance, coordination and flexibility. Wearing the right protective equipment including footwear. Checking the sporting environment for hazards prior to training and match play. Pain at the end of the collar bone. Pain may feel widespread throughout the shoulder until the initial pain resolves; following this it is more likely to be a very specific site of pain over the joint itself. Depending on the extent of the injury a step-deformity may be visible. This is an obvious lump where the joint has been disrupted and is visible on more severe injuries. Pain on moving the shoulder, especially when trying to raise the arms above shoulder height. 1 (mild) An athlete with a grade 1 injury of the AC joint will experience tenderness and discomfort palpation and movement of the joint. Grade 1 sprains involve only partial damage to the joint capsule and the AC ligament. Return to play – up to 3 weeks. 2 (moderate) A grade 2 injury will involve complete rupture of the acromioclavicular ligament and partial tear of the coracoclavicular ligament. This tearing allows the clavicle to move upward, and as a result the bump on the shoulder is more pronounced. Pain is more severe and movement of the shoulder is restricted. Return to play – minimum 4-6 weeks. 3 (severe) A grade 3 injury involves the complete rupture of the acromioclavicular and coracoclavicular ligaments. The bump visible in a grade 2 tear is even more pronounced in a grade 3 injury due to complete dislocation of the acromioclavicular joint. Return to play – dependent on management eg. surgery. The immediate treatment of any soft tissue injury consists of the RICER protocol – rest, ice, compression, elevation and referral. RICE protocol should be followed for 48–72 hours. The aim is to reduce the bleeding and damage within the joint. The shoulder should be rested in an elevated position with an ice pack applied for 20 minutes every two hours (never apply ice directly to the skin). The arm should also be immobilised in a sling. This may be for as little as two days in a mild injury or up to six weeks in a more severe case. The No HARM protocol should also be applied – no heat, no alcohol, no running or activity, and no massage. This will ensure decreased swelling and bleeding in the injured area. A sports medicine professional should be seen as soon as possible to determine the extent of the injury and to provide advice on treatment required. A sports medicine professional may perform a physical examination and take x-rays of the shoulder. Most AC Joint injuries are treated conservatively using various combinations of strengthening exercises following the immobilisation phase once pain permits. Surgery is usually reserved for cases where there is a complete dislocation of the AC Joint (Grade 3) or in cases where a less severe injury fails to respond adequately to conservative treatment.